Venus Fest is pleased to announce programming for the second edition of the festival, taking place at Toronto's MOD Club Theatre and the Opera House Sept 20-22. Synth-pop songstress Zola Jesus, poet and musician Moor Mother, and Nashville trio Bully are amongst many female-identifying and non-binary artists set to take the stage this fall. A full list of performers can be found below. Stay tuned for additional updates. 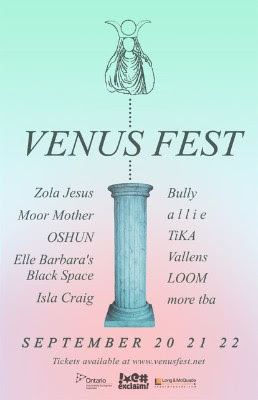 Founded with the intent to foster community, inclusivity and unification, based on feminist values, Venus Fest aims to provide a welcoming and safe environment for all attendees. The festival is committed to creating a shift in terms of the long standing industry trends that have dominated event programming and organizational structures by ensuring greater awareness around who has access and representation in the arts. It is this responsibility that dictates the festival’s mission to ensure a fun atmosphere that is respectful and tolerant, without enabling destructive behaviours or attitudes. The festival arrived in response to a well-expressed need in the music industry to create a new kind of space for artists to thrive in and for community members to attend with a sense of safety. The festival would like to recognize the support of OMDC, Exclaim!, and Long & McQuade in the presentation of the 2018 edition. Wristbands and tickets are now on-sale here.